Potato late blight (Phytophthora infestans) is a real problem for most organic growers, in most seasons. 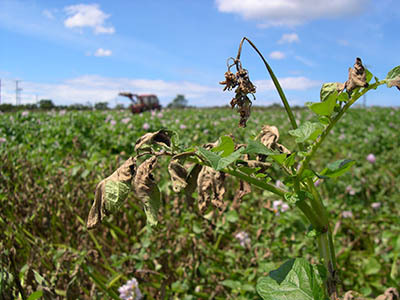 The blight fungus is evolving and some varieties that used to show resistance have now lost it. It is likely that copper will not be available for use against blight in the near future. So, how can smaller growers adapt and ensure they can successfully produce potatoes for their markets? This meeting, hosted by Fred Bonestroo, at Duchy Home Farm will explore issues around potato blight (varietal selection, adapting soils to the fungus, cultural management options, mesh covers) and try to work together to come up with trials and potential solutions. Discussion around growers experiences, future trials and the way forward.